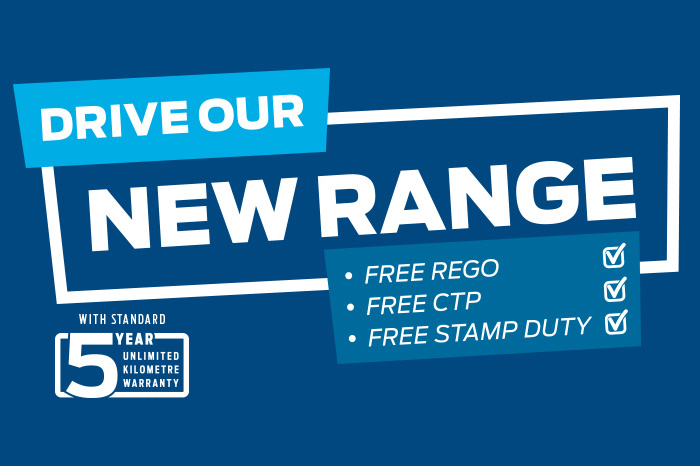 *Offer available on selected MY19 Ranger, Everest and MY18.75 Escape models. Excludes Ranger Raptor and Wildtrak. Offer includes 12 months registration, 12 months compulsory third party insurance (CTP) and stamp duty. Private and Small Fleet customers only, delivered from Sept 1, at participating dealers. See ford.com.au for full details. ^Driver assist features are supplemental and do not replace the driver’s attention, judgment and need to control the vehicle. They only function within a set speed range and may not operate in adverse weather. See ford.com.au for full details. †Warranty conditions apply. See ford.com.au/owners/warranties for full details.